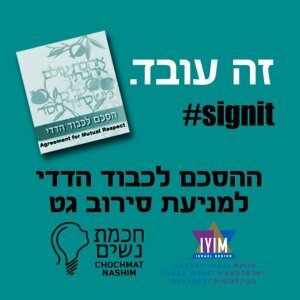 Following the highly successful postnuptial events that took place in 2016 (with the Efrat Women’s Beit Midrash) and in 2017 in Jerusalem (with Beit Knesset Nitzanim), IYIM is initiating postnuptial events as standard practice for getting the word out about the game-changing Agreement for Mutual Respect. Good people, good food, good will – all come together to provide a basis for a good life for the younger generation. PLEASE NOTE: Due to the fact that this is a communal signing event which is taking place as a group of couples within the community, if individual couples who sign at the event want to guarantee the validation of the document in a (civil) legal fashion, they may have to go afterwards to the Family Court (or there are legal opinions that it may not be necessary). At the community event attempts are being made to grant the document halakhic validity as each individual couple is signing before two kosher witnesses.